BabyBoutique doesn't have any items in their booth! Just a super person all the way around!! I know the owner of BabyBoutique not only as a fellow seller here, but we are on a business forum together where she has excellent input and ideas and is very active in the online business community! I appreciate that! A truly wonderful seller! Honest and caring, all around great person to deal with. 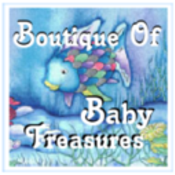 The BabyBoutique has an excellent collection of nursery, mom to-be and baby items of all kinds. The prices are very reasonable and her choices of items are very nice. A great asset to Bonanzle!